This Mother’s Day, skip the flowers and forget the chocolate (unless it’s dark)! Give your mom something she really needs—the gift of good health. No, you don’t have to buy her a treadmill. There are many other things you can do to give mom a boost in terms of her physical (or mental) wellbeing. Most moms will truly appreciate the fact that your Mother’s Day gift is aimed at keeping her happy, healthy, and in your life for a long, long time. THURSDAY, May 7, 2009 (Health.com) — This Mother’s Day, skip the flowers and forget the chocolate (unless it’s dark)! Give your mom something she really needs—the gift of good health. No, you don't have to buy her a treadmill. 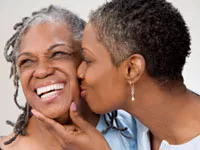 There are many other things you can do to give your mom a boost in terms of her physical (or mental) well-being. Most moms will truly appreciate that your Mother’s Day gift is aimed at keeping her happy, healthy, and in your life for a long time. In case you are drawing a blank, we came up with a list of healthy—and relatively inexpensive—gift ideas for every mom. 1. Give the gift of (your) time and support at the doctor’s office. "Offer to be your mom's health buddy," says Philadelphia-based women's health expert Marie Savard, MD, author of several books, including Ask Dr. Marie: Straight Talk and Reassuring Answers to Your Most Private Questions. "Promise to be there for any and all doctor's visits whether a mammogram or routine appointment," she says. "Most moms always say 'don't bother,' but another set of eyes and ears is always a good idea at a doctor's visit." The best part? This one is free. 2. Give the gift of healthy eating. Rather than an expensive, artery-clogging brunch, you can spring for a visit with the nutritionist and follow it with a healthy meal. "Mother's Day is a great reason to get your mom to see a nutritionist," says Dana Greene, RD, a nutritionist in private practice in Boston. "Nutritionists can really tailor their advice to whatever issues mom is having with her diet, including losing weight or learning how to eat to reduce her risk of certain diseases such as breast cancer or osteoporosis," Greene says. "An appointment lasts about an hour and is relatively inexpensive. Take mom out for a healthy brunch afterward and watch her put all she learned into practice." Greene also suggests subscribing to a healthy-cooking magazine to keep your mom in the healthy-eating mindset all year. Dr. Savard adds: "Make and freeze healthy foods in individual containers for your mom." She suggests making healthy versions of your mother's fave foods. 3. Give the gift of organization. Instead of making a photo album of family snapshots (although that's nice too), make your mom a folder containing all of her medical records, Dr. Savard says. "Put a folder together of test results and vital information so it is all in one place," she says. Make sure to include a list of all of her medications and what times she takes them. "Having all this information in one place could end up saving your mom's life." 4. Give the gift or a good night's sleep. Adequate sleep is linked to a lower risk of type 2 diabetes, as well as other health conditions. "Buy your mom satin sheets, a new mattress, a mattress cover, or a luxurious pillow to encourage better sleep," Dr. Savard says. "We know that restorative sleep is critical to our immune system and heart health." For new mothers, offer to watch the baby while she takes a nap. This will also allow you to spend quality time with the kids, so "it's a win-win," she says. 5. Give the gift of healthful goodies. Instead of a gourmet gift basket filled with cheese and crackers or sweets, make your own healthy gift basket for your mom, suggests Dr. Savard. Not sure what to put in it? Start with a multivitamin, calcium supplements, and vitamin D supplements. "If you know your mom is trying to get more fiber, put some fiber supplements in the basket too," she says. "A pedometer, some arm weights, and maybe a tape measure can also be part of this gift," Dr. Savard says. A tape measure can help mom measure her waist size, which is a known risk factor for heart disease and diabetes. 6. Give the gift that keeps on giving. Accessory and gift companies such as Presents for Purpose allow you to pay it forward this Mother's Day by picking gifts in which 10% of the proceeds benefit a charity of your choice. "This year we are all trying to conserve money, so why not have your funds go further with a gift that gives back," says company founder Alayna Kassan. Gift givers can choose from bathrobes, cosmetics bags, scented candles, and a plethora of other items—many of which are "green"—and then choose a meaningful charity from a list. "When your mom gets the gift, she will be notified that it will benefit the chosen charity," Kassan says. "We have a few breast cancer charities on the site and they all do well on Mother's Day." 7. Give the gift of chocolate—if you must. "If you are a traditionalist and you must give chocolate, choose dark chocolate," Greene says. Dark chocolate contains antioxidants, which can mop up the damaging free radicals known to play a role in heart disease and other illnesses, as long as you choose types with less sugar and fewer calories. "This way you can satisfy her sweet tooth and benefit her heart," she says.